Sam Buffington was a TV actor who appeared in occasional films. He was a supporting player and crammed over 40 appearances into his short career, which was cut short by his suicide at the age of 28. His balding appearance were that of a much older man, which got him parts as doctors, professors and sheriffs as well as bartenders. He was appearing in the Audie Murphy TV western series 'Whispering Smith' when he killed himself. Sam is on the right, with James Best. He was always so good. I like him as an obnoxious freeloader in a Hitchcock episode with Mildred Dunnock playing his sister. Sorry to hear of his suicide at such a young age. He could have given us many more years of excellent performances. Do you have any further information about the specific Hitchcock episode with Mildred Dunnock/ I have never seen but would like to. Just watched it! Season 2, Episode 35. "The West Warlock Time Capsule" It's on Netflix. I would appreciate any information regarding TV and/or movies with Sam Buffington. I am doing some research. I just watched the episode on AntennaTV, recorded yesterday's, and I did the same as you. He was so memorable I had to look him up. Ever watch American Dad? In the episode Haylias Stan hypnotizes Hayley into marrying a guy who HAD to have been based on Waldron (the mooch he played in "timecapsule"). This is the first time I saw him but recognized him immediately from American Dad. He made me hate him, which makes me love him. Sad ending to a great talent. 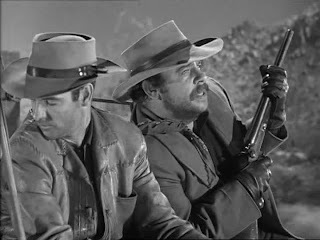 Sam Buffington starred in a short run (16 episodes) radio series LUKE SLAUGHTER of TOMBSTONE for CBS in the '50s. All 16 episodes are available for free download at the Internet Archive. Give it a listen! Wonderful show Luke Slaughter of Tombstone, and Sam Buffington had a great voice. Equal quality program with radio shows such as Gunsmoke, Have Gun Will Travel, and one or two others. Worth listening to for sure. He is on right this minute on Whispering Smith. So young to have so much anguish to end his life. Very sad. 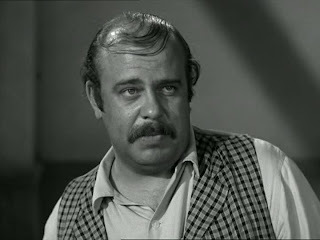 Just watched him tonight playing a drunk in an Alfred Hitchcock episode with Joseph Cotton. He was a regular on Whispering Smith, the TV show starring Audie Murphy. He played the police chief.